Not all hippo’s can dance ballet, but this one can! The ballerina hippo adult costume is a fun and unique costume that is perfect for Halloween or circus themed costume masquerade parties. The ballerina hippo adult costume is colored as pictured. Costume includes foam bodysuit with attached tutu, headpiece, and shoe covers. 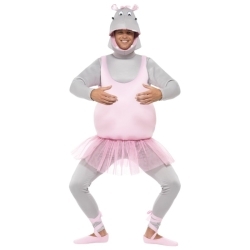 The ballerina hippo adult costume is available in adult men’s size standard.